The managerial economics major focuses on the tools and techniques of financial and quantitative analysis essential to the modern manager. "My sophomore year consumer finance course with Professor Tomas Dvorak was one of the most important courses I’ve taken. We learned how to manage finances and how money actually works. That was a perfect introduction to finance. I’ll be able to apply these concepts on a bigger scale." As a managerial economics major at Union, you will study content that includes monetary theory, banking and financial systems, analysis of markets, pricing theory, wage and salary/incentive theory, and the theory of competition. You will become well versed in applying econometrics and quantitative methods to the study of particular business enterprises and business problems. In addition to the standard intermediate economic theory courses, students must complete courses in managerial economics, financial analysis, accounting, computer science and mathematics, as well as an internship with a local organization. Majors are also encouraged to participate in a term abroad, as part an economics international exchange at the University of Antwerp, Belgium, or with the IESEG School of Management in Lille, France. 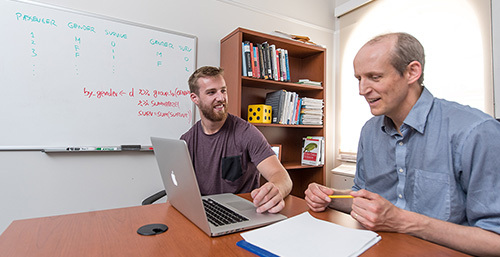 The real-world focus of this major will prepare you well for a career in the business arena and for programs of advanced study. Our majors have found success in all aspects of business and industry, including consulting, analysis, financial services and entrepreneurism.